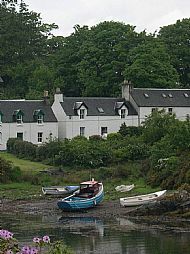 "An Taigh Dubh" is Plockton's Thatched Cottage . It is the only remaining "black house" in the village of Plockton. In the heart of the village this truly unique cottage enjoys a central yet peaceful location near the loch, just a short stroll to hotels, eateries and beautiful scenery. 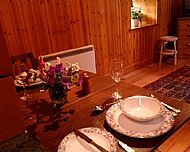 The cottage sleeps two with open plan living/sleeping accommodation, a well equipped kitchen, all modern comforts, and its own parking - it's just ideal! The Thatched Cottage sleeps a maximum of two, although it can also accommodate a small child in a cot. A cot and high chair can be provided if required. For full details visit our Thatched Cottage page here. If you are looking for a larger property in Plockton please see Caladh Reidh below which is nearby on Harbour Street. Caladh Reidh is a traditional cottage in the village of Plockton. Situated on Harbour Street, it sleeps 6 guests. It is a home from home in this picturesque village and enjoys a central location at the quieter north end of Harbour Street, just a short walk from all the village has to offer. 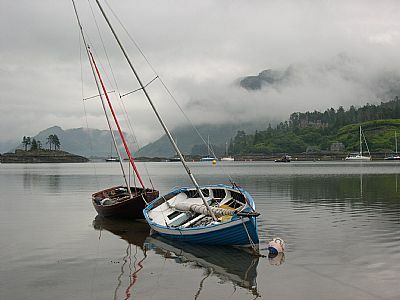 Local sailing boats at rest in Plockton bay on a calm misty morning. For information on sailing in Plockton or what the village has to offer, please visit our links page.